The wife and son of a British scientist are in a critical condition after being attacked by a giraffe on a wildlife reserve in South Africa. Katy Williams and three-year-old Finn were flown to hospital in Johannesburg on Monday after being trampled by a female giraffe who was with her calf. 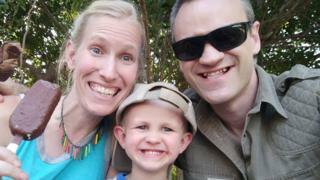 Sam Williams, who works on the Blyde Wildlife Estate, said the giraffe may have seen his wife and son as a threat. In a statement, he said he would "take one day at a time and remain positive". His wife and son are said to be in a stable but critical condition in a private hospital in Johannesburg. Both British-born Mr Williams and his American wife (who is also a British resident) are scientists with post-PhD experience in animal-related fields. The family live and work on the reserve in South Africa's Limpopo province. It is understood Mrs Williams, 35, and Finn were attacked at around 18:00 local time on Monday, about 150m from their home. Mr Williams, who was returning from a run, witnessed the attack and was able to chase the giraffe away before calling the emergency services. He called the accident an "unfortunate act of nature", speculating that the giraffe - which is not a typically aggressive species - had lashed out in defence of her two-month-old calf. Doctors operated on Finn in the early hours of Tuesday morning, to relieve pressure in his brain due to injuries sustained in the attack. "Dr Sam Williams would like to thank all doctors and medical personal from the hospital for their efforts to give his wife and son the best chance to heal," said the statement issued by Marina Botha, the lawyer representing the family. "The family said that they have decided to take one day at a time and to remain positive." Riaan Cilliers, the manager of the Blyde Wildlife Estate, said: "We are all in shock about this very sad incident and we ensure the family that they are in our prayers."